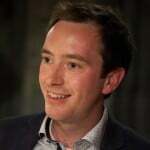 Home » Blog » General » Teaching for a post-fact world: What should schools do about social cohesion? Teaching for a post-fact world: What should schools do about social cohesion? Our new report, published this morning argues that divisions revealed by Brexit mean teachers and schools cannot avoid confronting the faultlines in our society. However it also points out that building cohesion should not require new curricula and frameworks. Involve pupils in decision making. Keep pupils safe from bullying. Arm pupils with the knowledge they need to scrutinise evidence and look beyond ‘post-fact politics’. 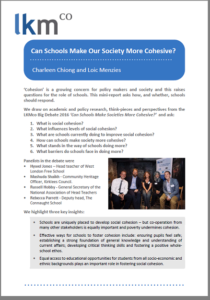 “Can Schools make our society more cohesive?” argues that schools are already too stretched to take on new responsibilities. However they remain uniquely placed to mend broken bridges between communities. They should therefore build cohesion through existing activities and work with partners from their local and wider community. It provides a range of examples of how some schools and other organisations have done this. The report goes on to argue that even in homogenous areas, poverty consistently undermines cohesion. It highlights research by Laurence and Heath showing that disadvantage is a stronger negative-predictor of cohesion than race. 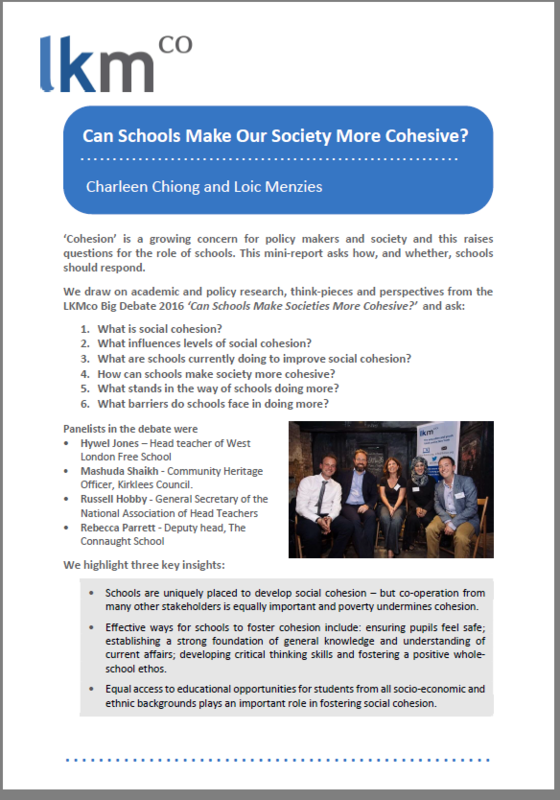 The report, “Can Schools Make Our Society More Cohesive?” combines exclusive new insights from school leaders and education experts as well as a body of academic literature. It identifies factors affecting social cohesion, and current barriers faced by schools that want to do more. 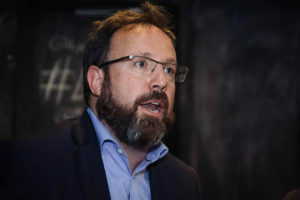 Whilst the report does not argue for curriculum change, it highlights renewed calls from Russell Hobby, General Secretary of the National Association of Head Teachers, to make Personal Social and Health Education (PSHE) compulsory, since it would help give Head teachers licence to address controversial topics in the face of community opposition. A wide range of factors, from individual to community-level characteristics, influence perceptions of cohesion. 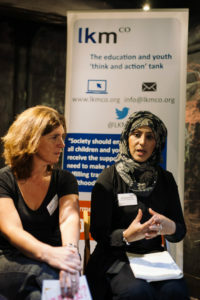 Schools are in a unique and important position to foster cohesion, but a broad range of partners need to help out in order to strengthen school-level initiatives. These include the wider community, the government, local authorities and charities/social enterprises. Socio-economic disadvantage is a particularly powerful negative predictor of feelings of cohesion and schools cannot tackle this link alone. Government should not sit back and wait for schools to solve the problem. Schools’ approaches should be tailored to their context, but all schools should ensure students (regardless of their background) acquire a strong foundation in general knowledge (history, geography, politics and current affairs). Developing their critical thinking, in particular their ability to demand and scrutinise evidence, is essential if they are to be insulated from the dangers of ‘post-fact’ politics. Students have a greater sense of cohesion when they feel safe. In order to promote cohesion, schools therefore need to protect pupils from bullying and build a secure environment for learning. Schools should involve students in decision making, for example through student voice. This gives pupils a sense of belonging and ownership which can promote cohesion. Ideally, activities should involve participation in the wider community, not just within school. Promoting cohesion does not require whole-scale curriculum change or new frameworks, but an element of compulsion (e.g. mandatory PSHE) may ensure schools feel licenced to approach controversial topics. This can create opportunities to foster pupils’ sensitivity and criticality when handling challenging topics.